Jomar is pleased to announce the launch of a new injection blow molding machine called the TechnoDrive 65 IBM. 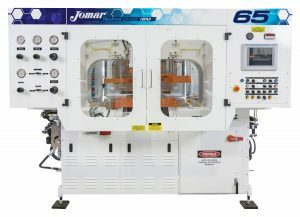 This machine is the high-speed, high-production version of the Jomar Model 65, which is Jomar’s most popular machine size for India and Asia. TechnoDrive 65 IBM machines have a dry cycle time of only 1.8 seconds, a full second faster than the standard hydraulic Jomar 65, which is already among the fastest IBM machines in comparable sizes. This high-yield machine further widens the gap and increases Jomar’s lead for having the highest output per square foot among injection blow mold machines. The TechnoDrive 65 IBM uses a closed loop cylinder system that allows the clamps to move with vastly improved speed and accuracy. The cylinders are no longer hammering at the top or bottom of the stroke, which prolongs the lifespan of both the molds and cylinder seals. The closed loop system works in conjunction with proportional valves that create a smooth, fast stroke that can stop at mold touch, then complete the clamping force required to make bottles. All TechnoDrive machines come with remote access capabilities, which allow Jomar’s Service department to connect to the machine via the internet. It also has a radial piston motor to drive the plastifier. This type of motor has extremely efficient volumetric displacement and can withstand the rigors of numerous starts, stops and reversals that are a part of the injection blow molding process. The main motor of the TechnoDrive has also been replaced with a motor that can generate true 50 horsepower output at 50 Hz, which is ideal for the Asian and Indian markets. The TechnoDrive is capable of delivering 41 grams per second of HDPE or similar resin. With a fill time of 5 seconds, the machine can accommodate molds that require a total shot size of up to 205 grams. Between the large shot size and lightning-fast cycle time, the TechnoDrive delivers high production at a cost comparable to the standard Jomar Model 65.